These are books that brought me joy, laughter, and taught me lessons as a child. 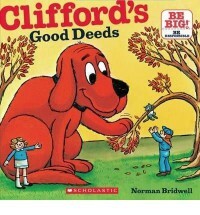 Clifford does a lot of helpful things for his friends and community. However, because of Clifford's size he cannot do things certain ways as a regular size person. This book teaches good manners and helping others. I would allow my students to do a good deed everyday in school and I will record their good behaviors/manners.